The Southern Claims Commission was an organization of the executive branch of the United States government from 1871--1873 under President Ulysses S. Grant. It's purpose was to allow Union sympathizers who had lived in Southern states during the American Civil War 1861--1865, to apply for reimbursement for property losses due to U.S. Army confiscations during the war. 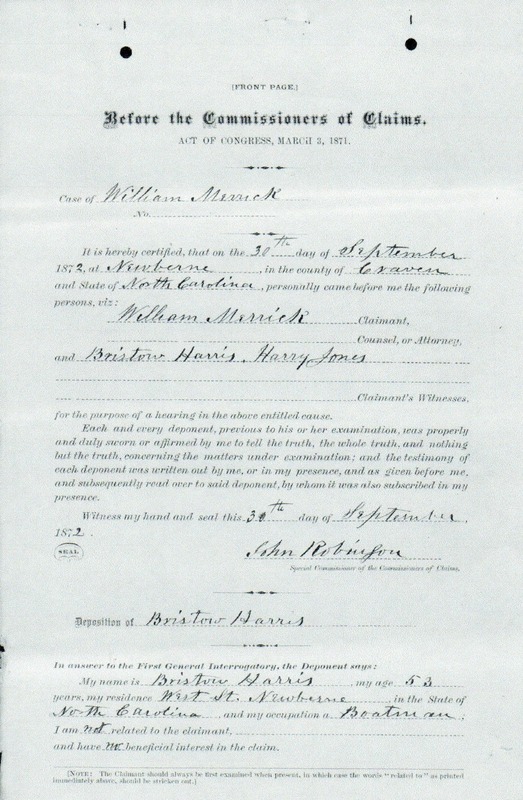 My 3rd great grandfather Bristow Harris provided a deposition on the behalf of a William Merrick for whom he had worked for during the period prior to and during the Civil War. William Merrick was in the business of making tar, turpentine, and cutting lumber. 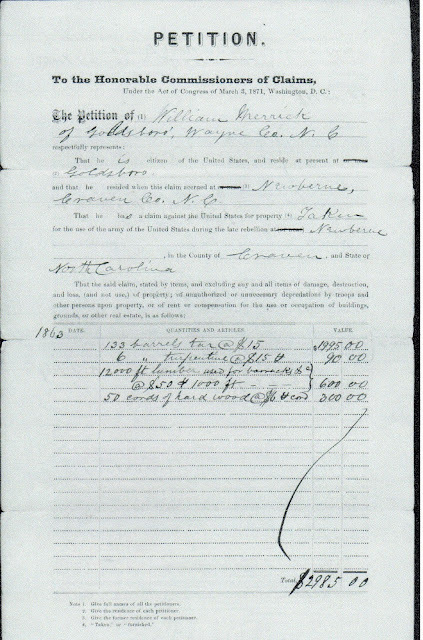 On September 30, 1872, William Merrick filed a claim to be reimbursed for property taken from him by Union troops. My name is Bristow Harris, my age is 53 years, my residence West St. New Berne in the state of North Carolina, and my occupation a Boatman; I am not related to the claimant and have no beneficial interest in the claim. I am in the fifty third year of my age. I reside in Newbern as above stated, and by occupation am a boatman. I have known the claimant for the last twenty years and have been intimately acquainted with him during the late rebellion. We both lived in Newberne. I saw him mostly every day during the war_"that if the confederacy beat, it would be an awful state for us." "We, colored folks, were all strong Union men, and ware so to-day"and expect to die so, The claimant never did anything not ne'er a straw to promote the confederate cause, and further, deponent saith not. I with others, was employed by Wm Merrick to make the tar. I cannot now say how much tar there was, I am of the opinion there was over a hundred barrels. The provost martial paid me for my work in making the tar, what he did with it I know not and further this deponent saith not. Read over in presence of deponent sworn to and subscribed by making his mark before me this 30th day of September 1872. Depositions of Nathan West as to property taken from Claimant Wm Merrick, by U.S. soldiers in N. Carolina during the late war. In answer to the first general interrogatory deponent says as follows. My name is Nathan West am about 47 years of age. I reside near La Grange, Lenoir County, N. Carolina, am by occupation a farmer, I am not related to Claimant and have no pecuniary interest in the claim. [This property was taken during Burnside's occupancy of New Berne] I was present. I saw 50 cords of wood, and as near as I can recollect true was 135 or 140 barrels of tar as near as I can guess. I did not see the lumber taken, and only heard my fellow laborers talk about it. The cordwood was taken by a colonel -it has been so long I forget the name. Capt Goldsley was quarter master, he tookd the tar and had it hauled off to the wharf. I saw it at the wharf. He had it hauled off in government wagons. How did the claimant become the proprietor of so much tar? 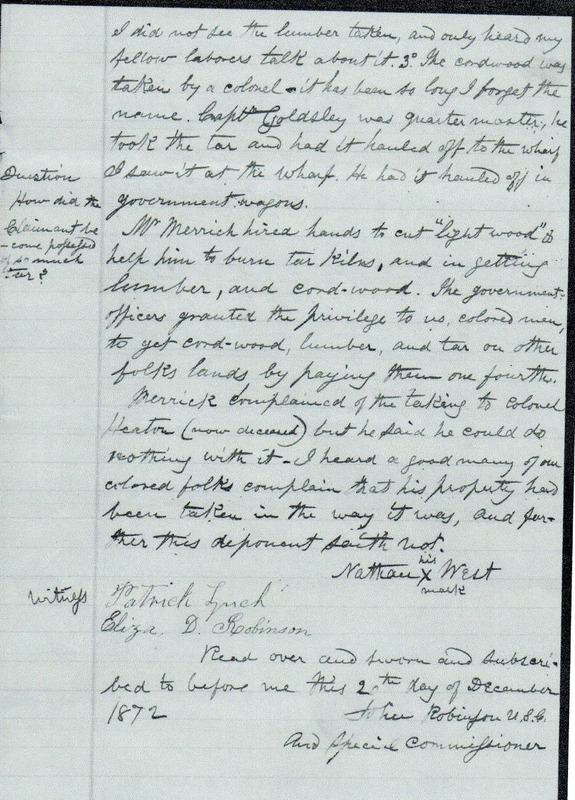 Wm Merrick hired hands to cut "light woods" and help him to burn tar kilns, and in getting lumber, and cordwood. The government officers granted the privilege to us colored men, to get cord-wood, lumber, and tar on other folks lands by paying them one fourth. Merrick complained of the taking to colonel Heaton (now deceased) but he said he could do nothing with it. I heard a good many of you colored folks complain that his property had been taken in the way it was, and further this deponent saith not. 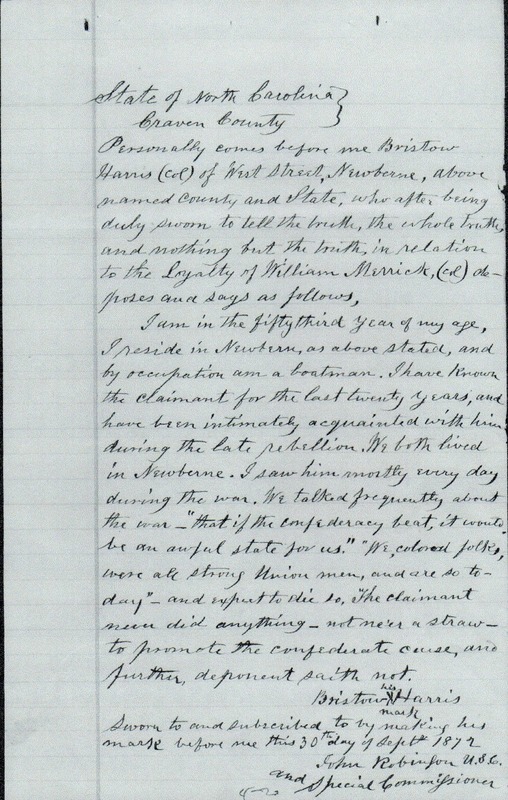 Read over and sworn and subscribed to before me this 20th day of December 1872. 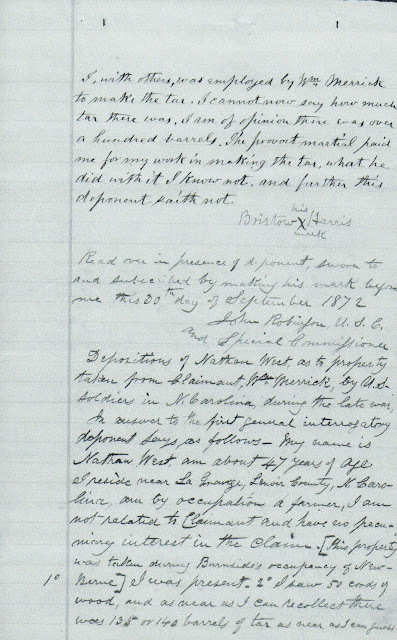 Anyway, the file continues on quite a bit more with the testimony of William Merrick and several others and an inventory of what was taken and valuations. Here's the page which shows the value of property taken. William Merrick eventually was reimbursed something, but from what I remember of the case I think it was less than $500. This claim was a great read because it gave me a tiny little snapshot of what was going on at a particular point in time in the life of my ancestor and his community.